Another somewhat unusual AUv3 from the maker of the equally as quirky Plectrum. 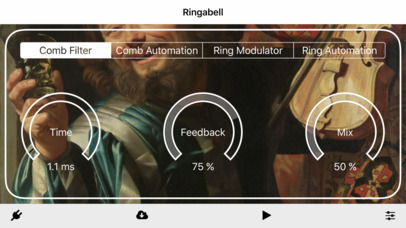 Ringabell AU promises an incredibly rich combinations of sounds, although doesn’t actually say how this is achieved except to mention that it has a comb filter and ring modulator in a single AUv3 effects plug-in. All of which is good to know and I’m sure will be very useful indeed. 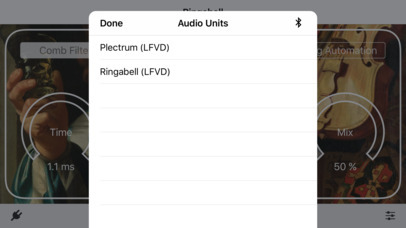 Also Ringabell AU has automated parameters which can apparently help you create complex patterns using the app. It claims you can build moving tremolos and flange ‘much beyond the common sense’. I’m really not sure what that means though, so you’ll have to make up your own mind on that count. It’s definitely an interesting idea for an app, I just would’ve liked a bit more information about it. So this is all I can give you for now.